The Moon. Mars. Asteroids. Deep space. These are all places that humanity would like to explore. So what's the holdup? Flight hardware, money and politics aside, there's some major problems that need further study if humans are to visit or colonize anything other than Earth, most notably: habitation and survival. Humans are fragile creatures, and the environments found off-Earth are decidedly unfriendly. We've been in space for 50 years. The International Space Station has been occupied continuously for over 10 years. We know a little bit about the physiology and psychology of living in space, at least for a few months at a time. But a round-trip mission to Mars, for example, would take much longer than even the longest-duration missions to ISS, on the order of seven months in each direction in the best case. That's not including an actual stay on the planet. And what's the point of going to Mars if you can't stay for a while? NEEMO (NASA Extreme Environment Mission Operations) sends crews of aquanauts to an underwater facility called Aquarius (owned by NOAA and run by UNC Wilmington) for up to three weeks at a time. Aquarius is home base for many marine biologists studying coral reefs and the environment of the Florida Keys National Marine Sanctuary, where Aquarius is located 62 feet below the surface. 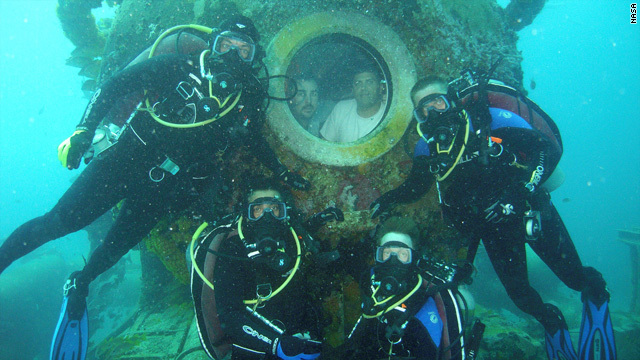 For NASA, NEEMO provides crews with an opportunity to experience some of the same challenges as they would in space. Aquanauts run experiments and go outside the spacecraft while living in close quarters. Since 2001, NASA has sent 14 crews to Aquarius. The first 13 were dedicated to general astronaut training, and the 14th specifically tested equipment and operations for space exploration. The next mission starts on October 17th and runs until the 29th, with the goal of testing equipment necessary for missions to near-Earth asteroids. The first stage lasted 15 days (November 15 – 27, 2007), and aimed to test the equipment, facilities and operating procedures for the trip to Mars. The second stage lasted 105 days (March 31 – July 14, 2009) and entailed six volunteer crew members living in an isolated living complex in Moscovw. The facility simulated all the necessary habitats for a trip to Mars, including the spacecraft, a lander, and the surface of Mars itself. The final stage of the mission is still in progress, and is a full-fledged simulation of a 520-day trip to Mars, beginning to end. It is scheduled to end November 4 of this year. To make the Mars500 study as realistic as possible, the two stages requiring crew isolation required that the participants communicate and work only amongst themselves. Communications to the "ground crew" included a 20-minute delay, which is about how long it takes for signals to reach Earth from Mars. NASA's Desert Research and Technology Studies (RATS) team spends time in the Arizona desert every summer in order to test technology, robotics systems and extravehicular activity equipment. The desert's extreme temperature swings and rough terrain provide analogs to some of the conditions that may be encountered in space exploration. Including 2011, Desert RATS has conducted 14 missions. This year, Desert RATS tested a habitat that may be used for missions to the Moon or Mars. Called the Deep Space Habitat (DSH), the facility contains living quarters, workspaces and labs. Two crews, Alpha and Bravo, spent several days inside the facility to see how well science experiments, medical procedures, and maintenance could be conducted. The crews were also testing to see how well the DSH supported daily crew activities, like sleeping, eating and socializing. These studies were conducted under varying conditions: switching up communications bandwidths to simulate delays between the crew and the "ground," changing crew sizes, and varying the presence or absence of rovers. You are so awesome! I do not think I've read through a single thing like this before. So wonderful to discover someone with some genuine thoughts on this topic. Seriously.. thanks for starting this up. This web site is one thing that is needed on the web, someone with some originality! We continue to waste billions of dollars that could be better used here on Earth. What's the point of going to Mars if you can't stay for a while? Oh, are you just kidding us? How will we do or get there when we find there's a quite bit of earth-like planet at Space? If we would use the money we are wasting on this nonsense to help our country, we could probably be out of debt. It continues to amaze me how not just the public but also science has been deluded into believing in ET, with no proof or evidence, yet continue to refuse to believe in the Lord for the same reason. Kind of a double standard in that contradiction. So much that they're spending...I mean wasting...all this money on their science fiction. The problem is this: humans break. Very easily. How many of us could survive in the wild here on Earth? That would be nothing in comparison to what we'd likely experience. Remember the early colonizing attempts in America? One winter and 10-20% of the colonists were left standing. I'm cool with this if proper training is prioritized. Dieing in space would be a good death. Mission completed or not. At least we could say we tried! Sounds good, but enough testing already SEND PEOPLE NOW. There are people that will go right now and waiver any financial insurance to do so. Science in the Universe needs to speed up a notch, religious people are starting to have barbaric feelings again.